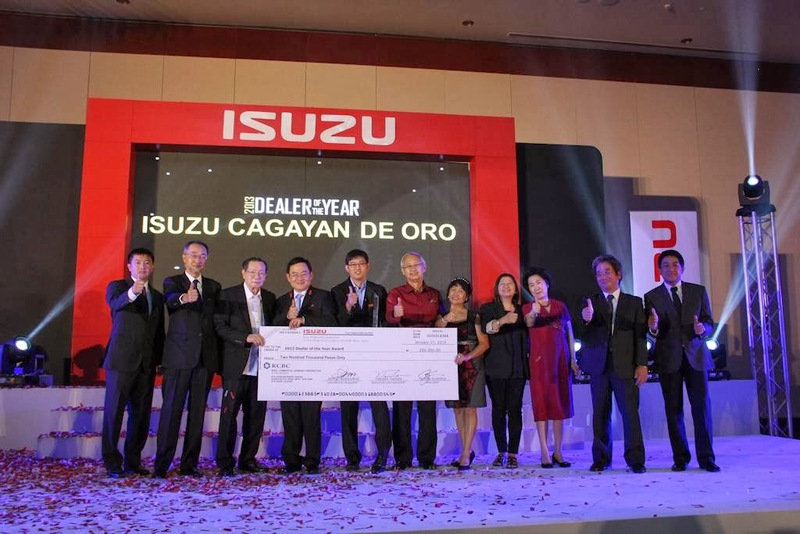 Isuzu Cagayan de Oro (CDO), for five years now, has been adjudged as the 2013 Dealer of the Year among all 21 authorized dealerships of Isuzu Philippines Corporation (IPC). The award—given recently at the Solaire Resort in Parañaque City—was handed over by IPC president Nobuo Izumina and executive vice president Takashi Tomita. In addition to the much-coveted recognition, Isuzu CDO also emerged as Best in Service Operations and Best in Customer Service Operations. The win by the CDO dealership marked the 5th time that a provincial dealership bested 20 other Isuzu dealers, in a showdown of predetermined sales & after sales metrics, measuring the Isuzu network’s performance on sales, implementation of sales support programs, maintenance of dealership facilities, compliance to parts & service and database operations parameters. Frank Rolida, president and general manager of Isuzu CDO, received the award, together with board of director Dr. Jerome Young, and assistant general manager and sales manager George Ongchua. Dealer principals, operators and sales people were in attendance for this special occasion. “We are truly honored for the awards we received and for the opportunities that Isuzu Philippines have given in order for us to excel and to continuously grow our business,” Rolida said. “We are very optimistic that 2014 will be another great year for Isuzu and its dealership network,” he added. Isuzu CDO was followed by Isuzu Iloilo and Isuzu Bulacan in second and third places, respectively. Isuzu Mandaue, meanwhile, got the Sales Team of the Year Award, while Michael Dennis Angelo of Isuzu Alabang was named Sales Executive of the Year. Other special awards were given and these included Best in Sales Operations (Isuzu Mandaue) and Best in Parts Operations (Isuzu Iloilo). Izumina expressed, “The Dealer of the Year Awards highlighted our dealer network’s consistent compliance of our stringent standards. It also indicates their eagerness to support IPC’s efforts in continuously improving dealer operations with the view to serving our customers better.” Izumina also commended all Isuzu dealers and challenged them to strive for sales excellence this 2014. Happy New Year from CarGuide.PH! Hyundai-PUP Scholars Embark on "Eco-Teaching"